"Mr. Hendrick says we can't run until it gets warmer outside," Bowman said. "He needs it warmer. I guess his car doesn't like it when it's cold or something, I don't know. But, that's eventually got to happen." "If I call him `scared' right now, it's going to end really badly for me," he said. "I do not think Mr. Hendrick is scared of drag racing my street car. But, I think he's just making sure he embarrasses me and doesn't just beat me by a little bit. He's got to beat me by a lot." "I know he has hired some people to purposely make his car faster than mine," Bowman said. "I've got a couple of tricks up my sleeve, too. We're both pretty invested in this race." "My kids keep me pretty humble," Almirola said. "My son, I told him I was excited about getting ready to go to Daytona before we flew down here Friday morning, and he said, `Daddy, I sure hope you win more than just one race next year.' So, my kids do a good job of keeping me in check. ... I try to do a good job of staying level-headed and, in the good times, just enjoy it, and in the bad times, just keep fighting." 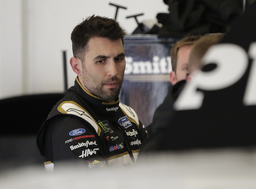 "There's a lot of luck involved," Almirola said. "You can do everything right. You can have a fast car. You can put yourself in what you think is the right position and get caught up in a wreck, so you've got to have things go your way and it's tough to win the Daytona 500. There are a lot of great race car drivers that have never won that race, so that's definitely something that we're looking forward to having the opportunity to do come next Sunday." "Did I ever have a moment where behind closed doors I stomped my feet and hit some things? Maybe," he said. "In that time, in that moment, it was more important for me to go out and be a good representation for my sponsors and my partners and my kids. My kids were sitting back in my motorhome watching on TV like the rest of the world, so at that time it was an opportunity for me to be a good role model for my kids." The team quickly reversed course and was conspicuously absent from the official Daytona 500 entry list and was a no-show when the garage opened for Speedweeks. Obaika Racing, owned by Nigerian entrepreneur, Victor Obaika, cited "limited resources" as the reason it could not compete. It was not immediately clear what happened to its finances in the two days between the press conference and its withdrawal. "We will compete in as many events as possible, and we will announce our 2019 debut race as soon as possible," Obaika said. Berryhill tweeted he was devastated he discovered "the opportunity of a lifetime wasn't." "I remember we were parked out in the dirt by Lake Lloyd because there was no room for us in the garage," said owner Tad Geschickter. "There were like 60 cars here. It was really an interesting week with a lot of pressure. But it's hard to believe we've done 25 of them now." Geschickter said NASCAR has a "tough business model right now" that makes it hard for teams to stick around for the long haul and be successful. "I will say this, 25 years in a tough model, I think it makes you stronger and a better businessperson; so I wouldn't trade it, Geschickter said. "But, just a little bit easier would be a good thing."